I fell in love with the Medallion background stamp when I first saw the new catalog. Putting in my first order, I forgot to order it. (I just wanted sooo much and my list was sooo big!) So, I had to wait a month to make my next order. It has been a long wait. I have seen some great cards made with this stamp set. I decided I wanted to play with the new Shimmer paint from the Holiday mini caddie coming out September 1st. I added one drop of the Platinum Shimmer Paint and 2-3 drops of Brilliant Blue refill ink. I used my brayer to mix the colors together. I then brayered the ink mixture onto the Medallion stamp and stamped the design on Whisper White card stock. Stamp the saying from All Holiday with Brilliant Blue Craft ink. I used Clear embossing powder to have it stand out. I popped out the light blue rhinestone from the Circle Ice brads and added it to the center of the medallion. I really enjoyed the way the card turned out. The Shimmer paint toned down the brightness of the Blue. I would love to do a workshop for you and your friends. This is a great way to learn new techniques, learn about Stampin' Up! and create some great cards. Please email or place on-line order with me. 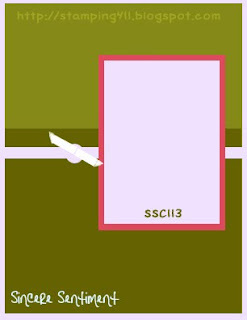 This is one of my favorite card design template. In this cards, I used a technique called crayon resist. I love how it turned out. Asian Artistry is one of my favorite stamp sets. 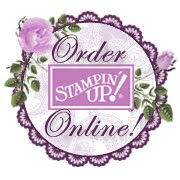 It is a Stampin' Up Hostess level 2 set. I thank you for stopping by! Accessories: Mistletoe Ribbon Originals, sponge, Yellow Crayon. This has to be one of my favorite stamp sets. I love the flowers and I see endless possibilities. I m absolutely in love with this blog look. I feel in love with this look from another blog and I wrote to Michelle to ask her if she would do the same kind of design but in my favorite color of purple. It's this the most elegant look! 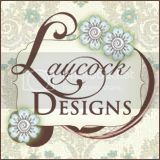 It has given me a new look on life and what I want to do with my stamping business. I can't thank Michelle enough! I left the link here if you would like to give your business a face lift. I feel so blessed. I am a Halloween freak. I love all the Halloween stamps Stampin up offers and I LOVE creating cards in my mind. (Does anyone else do that?) For the past two weeks, I have been looking up card challenges and creating cards…yes, you got it, in my mind. Today I sat down and I created one of those wonderful Halloween cards. Gotta love the big shot! This is where you bring your Big Shots machines to my house and make three projects. Pricing is $5 for those who bought a Big Shot from me, an advantage of buying from me and $15 if you purchased from somewhere else or you don’t have one. All of you will start a binder ring and each time you come you will cut another material to add to you ring so you have a visual reminder of all the things the BS can cut. Our first gathering will be on Friday September 18th from 7-9PM. If you are interested in attending, please email me! When having too much mind time, I was bugged by the fact I wanted to make a purell holder. I tried and tried but no mojo! So I asked one of my websites to help me out and I got one response. She was soooo incredible that she made this box for me. Her name is Belinda Johnson. She sent me pictures but non of them turned out very well and at the same time I got a lot of members asking me to send them pictures of this wonderful project. Enough is enough...I have been spending my time taking pictures, recreating, re-measuring, being really excited for my first tutorial! But before I show you how to make this wonderful project, I want to give a shout out to Belinda for spending her weekend creating this wonderful project for me! Thank you Belinda!!! Start with a piece of card stock that measures - 3" X 10 1/2"
Turn card stock and score at 3/4", 1 1/2", 4 1/4", 5", 7 3/4", and 8 5/8"
Cut as I have diagramed. Cut the 3/4" tab at an angles. This is what it will look like when you sart to put it together. The 3/4" tab will fold to the back of the box. This is a picture of the front of the box with side flaps. This is the finished project. It will hold a 0.5 fluid oz container. I used a pop up glue dots to adhere "thanks" so I could tuck the front flap under this embellishment. You can also use magnets or velcro. I am so happy with my creation. Please check back in a couple of days and I will have one more tutorial for a bigger bottle of purell. 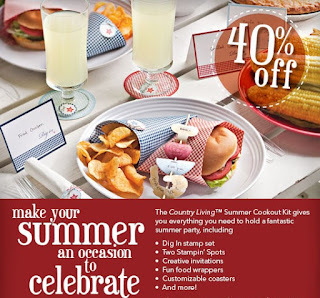 There’s still time to get the exclusive Country Living Summer Cookout Kit. Even better it’s now available at 40% discount through August 31, 2009. This kit is perfect for that backyard cookout or summer picnic. 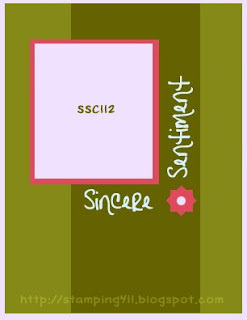 Click here to see what Stampin’ Up! founder and CEO, Shelli Gardner, did with the Summer Cookout Kit. I haven't ever made an Acetate card before. They seemed a little intimidating to me. Once I made this card, I felt it was very easy. I love the new Hostess stamp set call Kind and Caring Thoughts. It has so many different uses and it really touches my heart. AND…I love the new Rich Razzleberry In-Color Paper. I am just one of those Purple kind of gal.